Nestled in the hub of Clark County, the desert-inspired Government Center is one of Southern Nevada's most striking buildings. 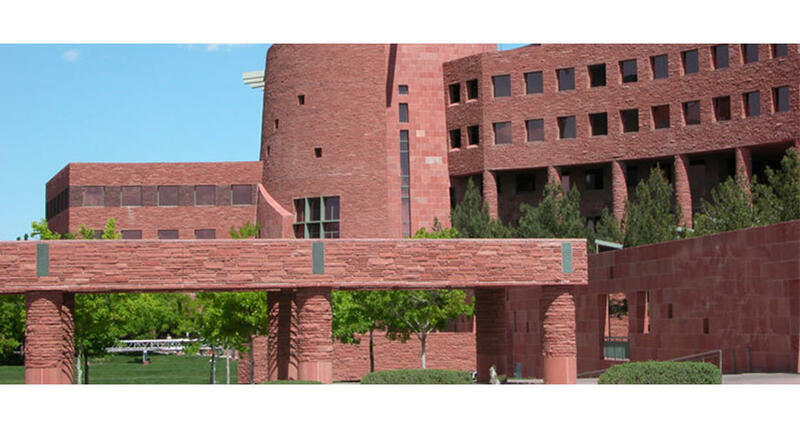 Designed by renowned architects Fentress Bradburn and opened in 1995, the Government Center's sandstone exterior reflects Nevada's historical ecology, while images of ancient petroglyphs imbedded in interior and exterior walls pay homage to its cultural heritage. The 385,000-square-foot facility stretches across 38.8 acres of land located in downtown Las Vegas. The Amphitheater is 280 feet in diameter and located on an acre and a half of land. The grounds are capable of accommodating almost any type of major public gathering, theater or ceremony. Within the larger setting of the desert, this protected zone of green forms an inviting refuge and garden. It is the one irrigated zone of lawn within the County complex. The Amphitheater is protected from wind and provides shade for activities, much like Mt. Charleston, the Toiyabe National Forest and Lake Mead offer citizens a place to escape the desert heat. The County Courtyard is the gathering place in the Government Center complex, shaded and protected by building walls that mimic the strata along ancient canyon walls. It is an oasis that hearkens back to the traditional County courtyard setting. The shaded arcade completes the circular form of the buildings. Three rows of trees are aligned with columns to frame a sloped lawn leading down to an amphitheater. A centered, raised platform creates the stage for performances and public addresses. The County Room, with its 80-foot diameter and 100-foot-high ceiling, is stylized after the Mouse's Tank at the Valley of Fire. The blue granite on the floor pattern imitates the life-giving desert pool, while the tan granite depicts surrounding desert sand. The roof symbolizes light filtering through rock crevices. The green balconies represent desert vegetation. Looking out the garden window, toward Red Rock Canyon and the Spring Mountains, the corridor represents a desert wash, carved from the desert floor and strewn with boulders.